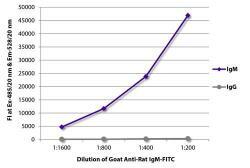 Specificity/Sensitivity: This antibody has been pre-adsorbed against Rat IgG to ensure minimal cross-reactivity. Cross-reactivity with other species, however, is possible. 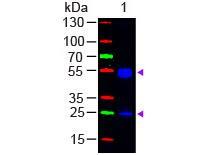 Specificity/Sensitivity: This antibody has been pre-adsorbed against Bovine, Horse, Human, Mouse, Rabbit and Sheep serum proteins to ensure minimal cross-reactivity. Cross-reactivity with other species, however, is possible. Specificity/Sensitivity: Cross-reactivity with mouse immunoglobulins has been removed by solid phase adsorption. Specificity/Sensitivity: This antibody has been pre-adsorbed against Bovine, Chicken, Goat, Guinea Pig, Hamster, Horse, Human, Mouse, Rabbit and Sheep serum proteins to ensure minimal cross-reactivity. Cross-reactivity with other species, however, is possible. 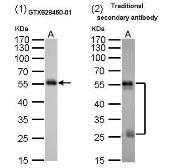 Specificity/Sensitivity: This antibody has been pre-adsorbed against Bovine, Horse and Human serum proteins to ensure minimal cross-reactivity. Cross-reactivity with other species, however, is possible.